i-Mate has sold over 4M windows mobile phones. This Dubai based company pressed on to reach the farther parts of the globe and has slowly gotten a significant presence in many countries. The present CEO of i-Mate has inherited the mobile industryâ€™s knowledge from O2 PDAs. He was involved in the team of O2. Developers of the first pocket PC phone. 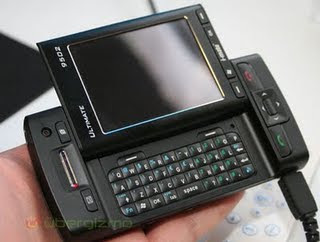 From its humble beginnings, it has sold worldwide many versions of Pocket PC phones. i-Mate is coming up with newer mobile phones that transcends the latest innovations in mobile technology. The latest mobile phone i-mate PDAL, a sleek, good looking mobile phone which has been launched in November 2007, is equipped with the Microsoft Windows Mobile 5.0 Pocket PC operating system which can let you to use some more advanced features. It comes with a 2MP camera with a display of 1600×1200 pixels. Size and weight is incredibly small and light weight. It has 64 MB of RAM and 128 MB ROM by default. Which lets you store large amount of songs, videos and images. The battery life is quite impressive, as it can give you a standby duration of 150 hours and 4 hours of continuous talk time. So go ahead and try it. To see is to believe.